Republic of Ireland manager Martin O'Neill hails the impact of his assistant Roy Keane after qualifying for Euro 2016. "Bringing in Roy is as big a decision as any I have made for a long time," he tells Sky Sports. "He's not taking too much of the accolades but he has been fantastic for myself, the backroom staff and obviously the players. "This is a special night, it can't be taken away from us. It's been a long road, 12 games, and when I look back it will be a very proud moment." Former Republic of Ireland midfielder Ray Houghton tells BBC Radio 5 live: "Martin O'Neill has grown into the job and has got more involved, the same with Roy Keane. This means so much to Martin. Jack Charlton was the last manager to qualify in his first tournament and Martin has done it. "Since the first game it has been a lot of effort, a lot of blood, sweat and tears. We haven't got the flair players like other international sides but every player that pulls on that green shirt gives 100% and goes into battle with everyone. "I was in Faro when Republic of Ireland were playing Gibraltar and Scotland were playing Georgia. It was flat around the stadium as everyone was thinking Scotland would get a result. We're just delighted to be there and it looked for a spell that we wouldn't do it." "I made that double substitution because I always felt we had to win the game," he tells Sky Sports. "I felt Bosnia had the capability to score goals and if they did that then momentum would have shifted towards them. We had to stem that flow. The changes gave us a bit of extra strength and momentum." More from injured Republic of Ireland goalkeeper Shay Given. He tells BBC Radio 5 live: "It was a tough draw, we had the world champions Germany, Poland and Scotland so it was the toughest draw of all of them. "What a hero Jon Walters is. He deserves all the acclaim he will get tonight. He gives us that presence on the pitch and he is the first in the gym and the last out." 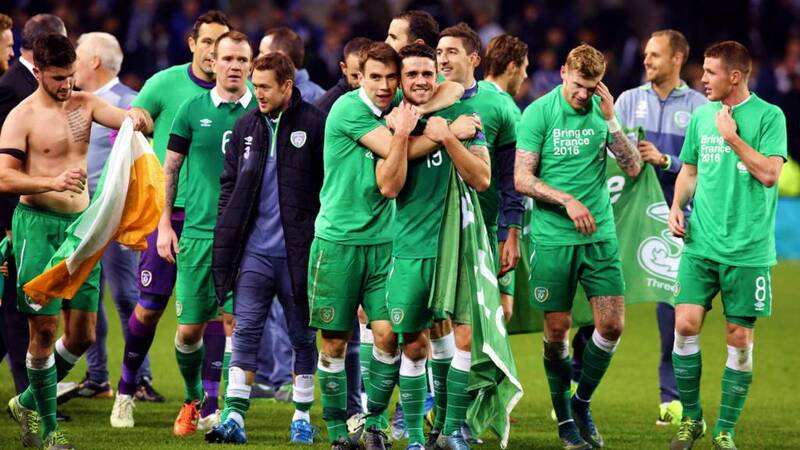 Republic of Ireland manager Martin O'Neill on Sky Sports: "I couldn't be more proud of this team. "They have been absolutely fantastic right from the start when Aiden McGeady scored to win 2-1 in our opening qualifier in Georgia. I thought then that the points could be crucial. "I hold the players in the highest esteem. They don't have everything, but courage and determination are things they have in abundance." Who knew Superman played for Ireland? Republic of Ireland's goalscoring hero Jon Walters on Sky Sports: "There was a whole team of heroes out there - we got there in the end. It is the best moment of my career in any shirt - to qualify for the European Championship finals is unbelievable. You've got to take in this atmosphere, these moments don't come around in a career very often. The management team deserve lots of credit - they have been excellent throughout the campaign." "The secret of being a top manager is that you get a little bit extra from every player and that's what Martin O'Neill does. It's a fantastic achievement. "Throughout the games they have had to pick Championship players and that's why this achievement is greater than before. In other Ireland qualification teams they have had four or five really top players." Republic of Ireland goalkeeper Shay Given, who missed the game through injury, has just been speaking on BBC Radio 5 live. He says: "It's phenomenal for the country, a great night. "The team spirit has been one of the biggest strengths and we haven't got a superstar. "We're all in it together and you see Robbie Keane celebrating just as much as anyone as if he was in the team. Every single player is proud to put on the jersey and you can see what it means to them." Republic of Ireland left-back Robbie Brady on Sky Sports: "The fact we're going to the Euro 2016 is unbelievable, I'm still in shock, it's the sort of thing you dream about. Getting into the play-offs, drawing away and coming back here to qualify is what we would taken before and we did it today. Everyone involved was excellent and now we're off to France. "My set pieces were dire before the one which set up Jon Walters's second but he stuck with it and he put that one away. I'm ecstatic. We never seem to do things the easy way, when things got tough, we stuck together and ground out those results. "Tonight is the best moment of my career." Ken Gorry: "Last year Darren Randolph conceded eight to Bournemouth. Now he is going to the Euro 2016. It's a funny old game. PS Jon Walters is a legend." We're still another seven months away from Euro 2016 but plans for the biggest ever European Championship are well under way. The tournament will see 51 matches across ten venues in France, from Lille and Lens in the north to Marseille and Nice in the south. The full draw for the finals will take place in Paris on 12 December at 17:00 GMT. Currently 22 teams have booked their place in the tournament: France, Spain, Germany, England, Portugal, Belgium, Italy, Russia, Switzerland, Austria, Croatia, Czech Republic, Poland, Romania, Slovakia, Turkey, Iceland, Wales, Albania, Northern Ireland, Hungary and Republic of Ireland. Republic of Ireland goalkeeper Darren Randolph, who started the last three qualification matches after Shay Given's injury, on Sky Sports: "It's unbelievable - I couldn't have written that script. Thankfully I got to play some games and we're through - that's all that matters." Scenes on the pitch are similar to the last day of the season. Players, draped in scarves, are walking round the pitch with their children waving at the crowd. No one wants to leave. "Ireland have been great because they haven't played that well in terms of football, but they managed the match superbly.Since the penalty, Bosnia's performance went down. They were arguing with the referee, the Ireland players and each other. "For the Irish it was great as they knew they had got them rattled. Ireland deserve it, but Bosnia beat themselves. "In terms of Irish managers, Martin O'Neill has probably had the least talented group of players available of anyone who has qualified. There are no superstars in this squad. Like Northern Ireland they have done absolutely brilliantly. In golfing terms, they are eight-under-par." Northern Ireland, Wales, England, Republic of Ireland...hands up who cannot wait for Euro 2016 to start? "Bosnia have played like angry men all night, but they have just not been good enough." The stewards have done their job. No fans have been able to get on the pitch but they are all staying to applaud the players who are on a lap of celebration. Shane Long has just gate crashed a TV interview with one of his team-mates. The champagne is flowing and Thin Lizzy's 'Boys Are Back In Town' is being played over the speakers. Adam Reid: Congratulations to ROI on qualification. Any team that can take four points and two clean sheets off the Germans deserve it. No one is going home. Martin O'Neill, in grey sweatshirt, is on the pitch going round to pat each and everyone of his players on the back. Start the party because the Republic of Ireland are going to Euro 2016. Jubilant scenes at the Aviva Stadium. So close for Bosnia. Vedad Ibisevic hammers the ball against the woodwork. John O'Shea gets a standing ovation as he replaces Glenn Whelan. It eats up another few seconds. "Defensively Bosnia made three changes out of their back four but that has not worked as they have conceded two goals. This is a cup tie, but Bosnia have not got it all night. "Pjanic is an outstanding player, but him, Dzeko and maybe Begovic, their star players, haven't been star players in these two matches." Pin-ball inside the Ireland area. A huge roar goes up as Darren Randolph throws himself on the ball. Ireland are nearly there. The countdown has started. Cries of 'Ole, ole, ole' as the Republic invite Bosnia to come and get possession. "Bosnia have lost all of their composure. All of them. It is like they have beaten themselves. Forget Friday, this was their cup final." This is their second game in 72 hours. They have run themselves into the ground and they are on the cusp of Euro 2016. Still the men in green are chasing everything. Absolutely everything. This has been a terrific performance by Martin O'Neill's men. Paul Mulligan: So the island of Ireland is heading to Euro 2016. Who thought that before qualifying? What an amazing achievement by both teams. Rt. Rev. Liam Reilly: I'm so glad that Jon Walters is 1,000 times better for Ireland than he is for Stoke. KAP: I bet Jonny Walters can do it on a rainy Monday night in Stoke! Ready for the longest seven minutes of your lives? The Republic are in control of this but they are not there yet. Shortly before Ireland's second goal Bosnia were fortunate not to have Emir Spahic sent off for another late challenge. The visitors have made their third and final change - midfielder Senad Luli making way for forward Vedad Ibisevic. Paul Mulligan: Jon Walters personifies this Ireland team - hard work and endeavour in abundance. Next summer should be fun! Foxy Boxy: Grealish should have opted for Ireland and a certain Mr O'Neill on this showing. John dunthorne: Whichever region of France hosts ROI will have lots of fun ( if not lots of sleep) ask the Poles. One thing is certain. We can't have extra time. If Bosnia get two goals to level on aggregate they are going through as away goals count double. Let's be clear. Ireland might have been fortunate with their first goal but there was nothing controversial about the second. Wonderful finish by Walters. Shane Long is clean through....he tries to lift it over Asmir Begovic and Bosnia escape. Into the last 15 minutes of normal time. What a noise. It sounds like there are 100,000 inside the Aviva Stadium. Home fans have started celebrating and there are still another 16 minutes of normal time remaining. Dublin is rocking! "It was a good free kick. Brady left footed and Bosnia didn't deal with it well. But it was good technique from Walters, a really quality finish." Jon Walters volleys home at the near post after Robbie Brady's free-kick is inadvertently hooked into the Stoke player's path. Is that the goal that confirms Ireland's place at Euro 2016? On comes Milan Duric, Haris Medunjanin makes way. 3gosouth: Keep the updates coming for an excited Irishman in Buenos Aires. Watched Argentina v Brazil in Monumental.This is way more exciting. Gareth Murray: Bosnia would have probably walked this tie had they had someone to put the ball in the net. Dave Watkins: Ireland need Harry Arter on if they want to get some control out there. McClean is useless. Kevin Samuelson: Dzeko to equalise soon. The television cameras close in on the crowd. There are nervous smiles, one or two fans cannot bear to look. Bosnia might be enjoying loads of possession but they can't unlock this green defence. Twenty five minutes and counting. Ramsey Gordian: No disrespect to Bosnia but Ireland will make a better addition for France 2016. "Robbie Brady has been outstanding apart from his free-kicks. He has had five now and they have all been rubbish." Half an hour to go. It's getting tense. Really tense. Bosnia are enjoying lots of possession but the men in green are throwing their bodies at everything to keep the ball out. Shane Long is on. So too James McClean. Wes Hoolahan and Daryl Murphy have made way. Gerard Boyd: Atrocious penalty decision. Bosnia a better team technically but lack a goal scorer. Kevin O'Dwyer: I'm following your updates from India! Let's hope you and Ireland keep it up in the second half. JavelBleach: Much better from Bosnia. Got their ears burned at HT! Ireland have hardly had a kick this half. "It is as though the Bosnian player did not expect the ball would get to him. It was a fresh air shot." Maybe, just maybe, this is going to be Ireland's night. A huge chance for Bosnia...and they mess it up. Edin Visca tees up Senad Lulic but he gets his feet in a terrible tangle on the edge of the six-yard area and a golden opportunity is wasted. Was that Bosnia's big chance? "Bosnia have got their passing going and are trapping Ireland in their own half. "Concentration is key for Ireland. The defenders have to stay on their feet and don't do anything stupid." A huge roar goes up as Shane Long prepares to come on. That's Shane Long who scored the winner to defeat world champions Germany last month. That noise you can hear? It's the sound of nails being bitten by thousands of Ireland fans. Jeers ring out each time a white shirt is on the ball. This is going to be a very long half for Ireland. Bosnia have come flying out of the traps. Edin Visca has a shot charged down before a curling free-kick is glanced over his own bar by Ciaran Clark. "Ireland need to keep their concentration and not do anything stupid." Change for Bosnia at the start of the second half. On comes Everton's Muhamed Besic for Edin Cocalic. That's an attacking switch. Olympic long jump gold medallist Greg Rutherford has given his view on the controversial moment of the first half. But 20-time champion jockey AP McCoy does not care that it was a fortunate decision. Paul Gourley: Talk about Bosnia being robbed here, first leg should have been called off due to fog and now a farcical penalty. Former Republic of Ireland defender Darren O'Dea is liking what he has seen so far. "Ireland have managed the game much better than the Bosnians. They have harried and hurried, and stopped the Bosnians playing. "They have been getting angrier and believing the referee has done them a disservice - he might have done. But they need to forget that. I think we will see a reaction from the Bosnians after the break." Oh, the irony of it all. Remember the Republic being denied a place at the 2010 World Cup by Thierry Henry's handball? Well, another controversial handball has put them on the brink of a place at Euro 2016. However, there's still work to be done. One additional minute. This has been a very good half for Ireland. Martin O'Neill just cannot sit down. He's like a jack in the box inside the technical area, pointing, shouting, even screaming instructions. It's exhausting just looking at him. "You can't take your eyes off this match. It is not high on quality but it is frantic. "Bosnia are just starting to find some creativity and starting to dictate the game. This is an important few minutes for Ireland." What a take by Asmir Begovic. He recovers from his error moments earlier to pluck the ball from the head of Daryl Murphy following a delicious cross by Jeff Hendrick. Joel Ike Ikechi: Jon Walters...does he get tired? No, he doesn't, he is a beast. He keeps running all day, he reminds me of Dirk Kuyt. John Pierce: ROI game hinges purely on discipline, if the guys in green keep their heads then it's game won. JavelBleach: Don't see what was wrong with the penalty decision. His arm was there to deflect the ball. Didn't need to be. "What Begovic did there was symbolic of this Bosnian team. They think they can have an extra touch in their own half but you can't do that against this Ireland side because they hustle, harry and make you play with your head down." Nearly a schoolboy error by Asmir Begovic who takes one touch too many and his clearances is intercepted by Wes Hoolahan. Fortunately for Begovic and Bosnia Hoolahan handles and the keeper's bluhes are saved. Huge chance for Bosnia. The ball falls invitingly for Haris Medunjanin in the 'D' but he lashes a volley high and wide. His look of disgust says it all. Great game now - everything to play for. "Bosnia need to stop moaning, it is overtaking everything they are doing in the game. They are still playing very angry. The problem is you can't play football very well when you're angry." Bosnia's players look more interested in arguing with the referee rather than hauling themselves back into this. Not that Ireland care..
Edin Dzeko fires into the side netting from just outside the area. It's a decent effort and Ireland fans are breathing a sigh of relief. This tie might have started slowly but it's end-to-end action now. So, Ireland lead on the night and 2-1 on aggregate. Remember, away goals count so if Bosnia level they're right back in this. "That's a very well-taken penalty - it was a while until he could take it. Bosnia are still complaining to the referee - they have been harshly done by. They need to score anyway so it doesn't change their gameplan. "But their problem is that they haven't played well enough and haven't looked like scoring. Their body language doesn't look good - they feel really hard done by." Jon Walters beats his former Stoke City team-mate Asmir Begovic with an excellent spot kick. It might have been a harsh decision but Walters gave Begovic absolutely no chance. "It is a massive shout. No doubt it hit a Bosnian player on the hand, but I don't think so. First look it is quite harsh. "There is nothing he can do - other than put his hand down his pants." This is 100mph, helter-skelter stuff. Neither team is holding back when it comes to challenges and Bosnia's Emir Spahic is the first to be booked for a crunching tackle that takes out Jeff Hendrick. "This is not a great game. But at the moment Ireland are shading it. Down the left through Brady and Hoolahan they could have the key to unlocking this Bosnian defence." Impressive start by Robbie Brady. The Norwich City man delivers another inviting cross into the Bosnian penalty area but the visitors just about manage to scramble it clear before Daryl Murphy can cause any damage. What an atmosphere. Imagine what Ireland's fans will bring to Euro 2016 if they get through. Lots of noise for sure. Bosnia are having a decent spell of pressure but they have yet to test Darren Randolph. "That was a good overlap from Brady, a good ball in, just 18 inches from Jon Walters. Begovic did well to clear with his foot. "Both teams have got themselves in positions where they keep giving the ball away." Almost a dream start for Ireland. Robbie Brady with a clever run and low cross delivered to the feet of Jon Walters on the edge of the six-yard area but Asmir Begovic is able to block. "This is like a schoolboy game at the moment. Have the ball, have a dribble, try to make a pass. No-one can make a pass!" Haris Medunjanin tries to pick out a white shirt inside the Ireland area with a long hoof but it's far too strong and it sails into the hands of Darren Randolph. Very little skill on show so far. "It was the start everyone thought we would get considering there is a Euro 2016 place at stake - it has been nervy and stuttering. No-one has got the ball down and passed it. We haven't seen two passes strung together yet." Free-kick to Ireland deep inside their own half. Already clear they are in no rush. Good news for the Republic? We've been asking how you think tonight's tie will be settled, and 67% of you are backing Martin O'Neill's men to do the business in 90 minutes. You can see the full results at the top of the page. Thanks for voting. Edgy start by both teams in front of a raucous crowd. Richard Keogh mis-kicks the ball out of play before a Bosnian move breaks down after a careless pass. Nerves evident already. This is it...it's now or never for Ireland. We're under way. It is a 50,000 sell-out at the Aviva Stadium as Ireland look to make it to Euro 2016. A minute's silence is being observed before the game in memory of the victims of the Paris attacks. Ireland...Ireland...Ireland...the home fans are in fine voice as the teams warm up. The Aviva Stadium is always a special sight when full. Tonight is no exception. The teams emerge to thousands of cards sporting Ireland's national colours which are being held aloft by home fans in a sell out 50,000 crowd. There's a fair few who have made the journey from Bosnia too. If the match is as good as the atmosphere, we're in for a cracker. Quote Message: I'm sure he'll be excited for about the game, but I also think we'll be ready for his qualities and try to limit him as much as possible. I will speak to some of the defenders in our team about Jon. He's a good quality player and a seasoned pro that has played in the Premier League for a very long time. His quality is there for all to see." I'm sure he'll be excited for about the game, but I also think we'll be ready for his qualities and try to limit him as much as possible. I will speak to some of the defenders in our team about Jon. He's a good quality player and a seasoned pro that has played in the Premier League for a very long time. His quality is there for all to see." "It has been so far so good for the Republic of Ireland in this tie. Now they are playing in a much bigger stadium in front of a partisan crowd. Although they must decide whether to stick or twist. For Bosnia it is simple - they must score otherwise they are out." Quote Message: We have to start on the front foot, we have to go for it. We have a good enough squad of players, we're on our home patch in Dublin, there will be a great atmosphere...we don't want to be sitting on a 0-0 and the last 15 minutes being so edgy. It only takes one set-play, one deflection and you're not going to France. We don't want that." We have to start on the front foot, we have to go for it. We have a good enough squad of players, we're on our home patch in Dublin, there will be a great atmosphere...we don't want to be sitting on a 0-0 and the last 15 minutes being so edgy. It only takes one set-play, one deflection and you're not going to France. We don't want that." Martin O'Neill's side will be greeted by a sea of green, white and orange when they walk out at the Aviva Stadium shortly before kick-off. Around 15,000 cards decked in the colours of the national flag have been produced for fans to hold up when the teams emerge from the tunnel. Republic of Ireland manager Martin O'Neill on Sky Sports: "It has been a long tournament for us - this is our 12th game - but the players are ready." On his team selection: "John O'Shea is coming back from injury, he has trained over the last few days but he has not played any competitive football. Tonight, if this going to go to extra time or even penalties, then it could be a long evening. The last thing you want is someone pulling up. Shane Long offers us an option off the bench, he is confirmed as fit, has trained and kicked the ball - he's fine." On his side's approach: "If you have a mindset of keeping them out - I don't think that will happen. Bosnia are capable of scoring goals. But we can win the match." "As a nation Ireland has never sat well, both in football and rugby, with being labelled as favourites. It is a tag they hate, and their best football results have been when they are completely unfancied. "We know a 0-0 draw is great for Ireland but it is a difficult situation. How do you get a 0-0? Do you sit back and try to keep Bosnia out? No, because you need goal threat. For Ireland, the scenario might keep changing." Remember the fog which threatened the first leg in Zenica on Friday? At one stage there were concerns the match might not finish, with both teams facing the prospect of returning the following day to complete it. Well, you will be pleased to know there are no such problems in Dublin, where visibility is very good. It's a cloudy and chilly night in Ireland's capital which is gearing up for a long night of celebrations if their team qualifies. Quote Message: People probably questioned the partnership between Martin O'Neill and Roy Keane at the beginning and were wondering how they would get on because they are two big personalities. They actually bounce off each other really well. Away from the training ground they are always talking and they work really well together.They have clicked and they have got on well together." People probably questioned the partnership between Martin O'Neill and Roy Keane at the beginning and were wondering how they would get on because they are two big personalities. They actually bounce off each other really well. Away from the training ground they are always talking and they work really well together.They have clicked and they have got on well together." So, a goalless draw will be enough to send the Republic of Ireland to Euro 2016. You're the boss. What do you do? Park the bus and play for a 0-0? Or go all out for victory? Tweet #bbcfootball, text 81111 (UK only) or post a message on the BBC Sport Facebook page. Let's get one or two things straight before the action starts. There will be extra time if the score is 1-1 after 90 minutes. And away goals count after 90 minutes and 120 minutes if necessary. So, a 0-0 draw will be enough for the Republic of Ireland to qualify. Bore draw, anyone? So, one change to the Ireland line-up that started in Zenica on Friday, with Stoke City forward Jon Walters returning from suspension. Stephen Ward makes way. Republic of Ireland XI: Randolph, Coleman, Keogh, Clark, Brady, Whelan, McCarthy, Hendrick, Hoolahan, Walters, Murphy. Subs: Forde, Wilson, O'Shea, McGeady, Long, Keane, McClean, Christie, Ward, Gibson, Arter, Henderson. There's three changes for Bosnia. Defender Ognjen Vranjes in for the injured Mensur Mujdza. Defender Sead Kolasinac and midfielder Haris Medunjanin also return to the side. Bosnia-Herzegovina XI: Begovic, Vranjes, Zukanovic, Spahic, Kolasinac, Medunjanin, Cocalic, Visca, Pjanic, Lulic, Dzeko. Subs: Sehic, Bicakcic, Besic, Ibisevic, Hodzic, Susic, Sunjic, Djuric, Hajrovic, Hadzic, Salihovic, Buric. No Shane Long or John O'Shea in the Republic of Ireland starting line-up but Jon Walters is back from suspension. Will Ireland join the party? Northern Ireland are there. So too England and Wales. Will the Republic of Ireland also be travelling to France for next summer's European Championship? A 1-1 first leg draw in Zenica on Friday has left them in the driving seat. With away goals counting double, a goalless draw in Ireland's capital will be enough to see them through tonight. Ireland's play-off history is shrouded in heartache. They missed out on Euro 96 and Euro 2000 in the play-offs as well as the 1998 and 2010 World Cups. Can they avoid more pain and rejection to join their neighbours in France next summer? It started 435 days ago with a dramatic 90th-minute winner in Tbilisi. The journey has been filled with highs and lows, the euphoria of victory over world champions Germany followed by heartbreak in Warsaw. All that blood and sweat shed over the last 14 months now boils down to what happens on a November Monday evening in Dublin. One last push is required, one last hurdle needs to be negotiated. If the Republic of Ireland are to appear at Euro 2016 they need to see off Bosnia-Herzegovina. It's now or never for Martin O'Neill's side.